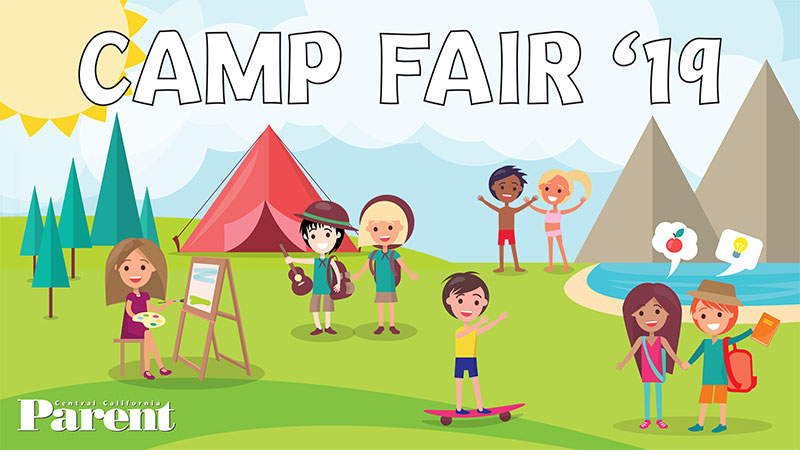 Tuesday, April 9th, 2019 from 3-7 p.m.
You won’t want to miss Camp Fair. This is your opportunity to talk to camp representatives from sleep-away camps, day camps, local sports, activity and enrichment programs to plan the best summer for your child! It’s the perfect opportunity to meet one-on-one with camp reps, ask questions, see pictures or videos, check out the displays and collect information to plan the best summer for your kids. There’s plenty of FREE parking and admission is completely FREE. It’s a one-stop camp extravaganza! RSVP for Camp Fair to stay up to date on all the happenings! Camp Fair ’19 is brought to you by Central California Parent, your trusted resource for over 25 years! Stay connected with Central California Parent and watch for more details! Call (559) 435-1409 or email ccparent@ccparent.com if you have any questions! Stay connected with Central California Parent and watch for more details! Or you can call (559) 435-1409 or email ccparent@ccparent to be put on our email notification list!